I have seen birdhouses similar to this in home décor stores and I think they are very interesting as pieces of art. This is an imagined scene with a multi-tier birdhouse, a birch tree and a berry vine. Faber-Castell Pitt Art pens with Holbein and Daniel Smith watercolors in a Stillman and Birn Beta sketchbook. 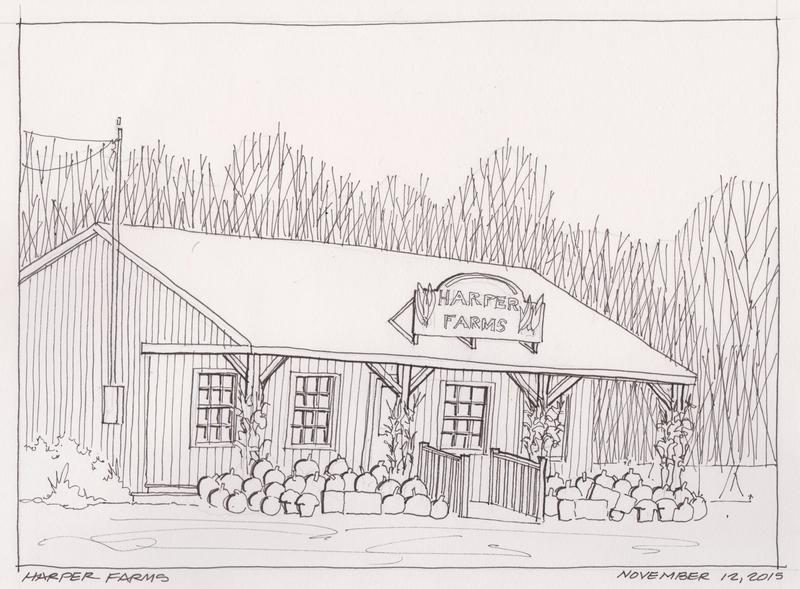 Harper’s Farm & Garden is a fourth generation family farm owned and operated by David Harper. The farm was originally located in Greenwich, MA and relocated to Lancaster, MA in 1903 by the great grandfather William Harper. This farm stand located on rte 117 in Lancaster, Massachusetts. The farm is displaying pumpkins and some late mums on the exterior late in the fall season. Lamy fountain pen with Noodler’s black ink in a Stillman and Birn sketchbook. 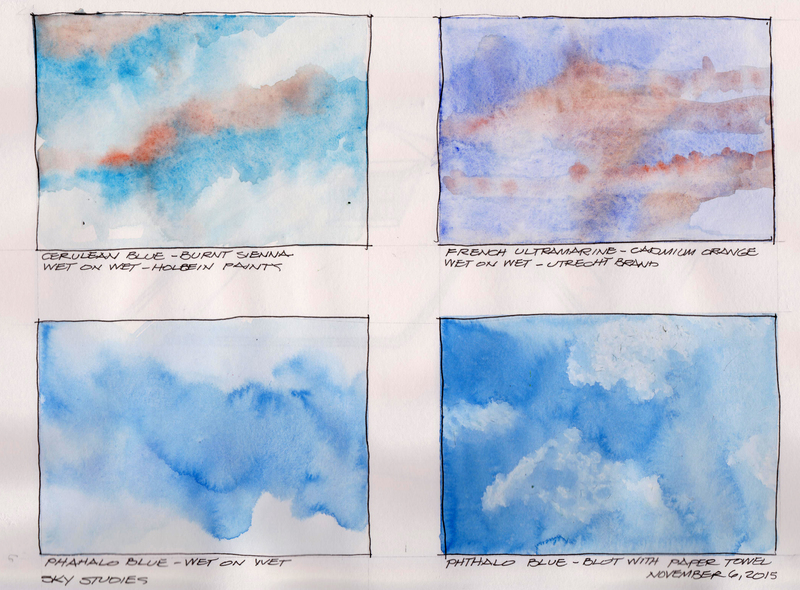 This is a study of 4 skies in my sketchbook using different blues as a base. All 4 were done wet on wet and each one is about 3″ x 5″. 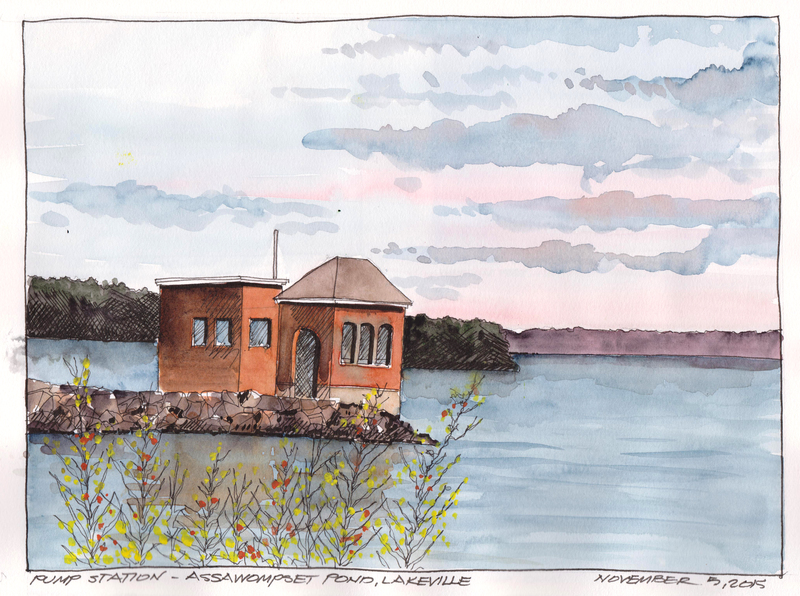 The first one is Cerulean Blue with Burnt Sienna highlights – Holbein Watercolors. The upper left is French Ultramarine with Cadmium Orange highlights that are more streaked- Utrecht Watercolors. Bottom left is just Phthalo Blue Holbeiin Watercolor. The final study in the lower left is also Phthalo Blue with color removed with paper towel while still wet. This is a technique that I use often for skies. The paints do not mix or flow as well on the Alpha paper as they would on true watercolor paper.